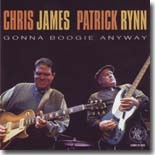 A couple of San Diego blues dudes, Chris James & Patrick Rynn, pair up for a great classic Chicago-style blues disc, Gonna Boogie Away. It's our Pick Hit for the month. Louisiana guitarist Troy Turner released his first album in a decade, and one of our reviewers believes that Whole Lotta Blues is a candidate for best CD of 2010. It's this month's Surprise feature CD. This month's Flashback feature looks back at the excellent 1993 Alligator debut, Back Where I Belong, from veteran blues harmonica cat Billy Boy Arnold. Our What's New section features new releases from Elvin Bishop, Teeny Tucker, Harper, Les Copeland, Magic Slim and his Teardrops, Julius Pittman & the Revival, Rob Stone, Andy Cohen, Michael Packer, and more.